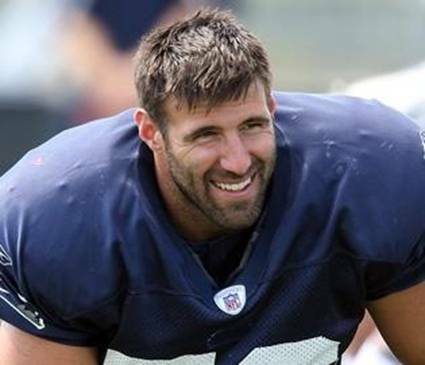 Former Patriot linebacker Mike Vrabel. FOXBORO — When the Patriots traded Mike Vrabel in 2009, Bill Belichick felt so strongly about the linebacker that he issued a statement. "Mike Vrabel epitomizes everything a coach could seek in a professional football player," it read. "Toughness, intelligence, play-making, leadership, versatility and consistency at the highest level." It's only fitting that such a coachable player went on to be a coach. Vrabel is currently serving as the linebackers coach for the Texans, and Belichick leapt at the chance to talk about his former player this morning. He said he knew Vrabel would pursue this career path. "Mike and I talked about that a lot," Belichick said. "(As a player) he'd give me advice, and I'd say, 'Mike, when you're a coach, you should go ahead and do that. Here's why we're not going to do that.' Or, 'That's a great idea. We can do that. I'm glad you brought that up.' Mike's not afraid to make a suggestion." Belichick believes Vrabel is using his time as a player as a tool to become an even more effective coach. "I think Mike's got a great mind for it, great passion for it. He's got great playing experience. He can draw on things. I never played in this league. I can't draw on those," Belichick explained. "I think there's definitely an advantage. I don't think that's a ticket. There's a lot of other things that go into it, too, but I mean that's something that, if it's used properly, I think it's valuable." As a Patriot, Vrabel played on both sides of the ball. He gained notoriety as a linebacker, but also played tight end in red zone situations. According to Belichick, he was also moonlighting as a free safety. "And Mike, he would love that. He'd drive Brady crazy. It's Ed Reed, you didn't know where he was going to be. He was usually wherever the ball was. He somehow got there. So, Mike did that. You could just see his overall passion for the game, whether it was offense, defense. He had a great total understanding of the game and loved to play it. Loved to play tight end. If it was a big receiver, he'd play receiver (on scout team)."